Model 1201B/C delivers better than 100 ns accuracy and includes the most highly sought after features in a precision time clock as standard plus many enhancements. Three terminal strip outputs are jumper selectable to unmodulated IRIG-B, modulated IRIG-B, 1 PPS, programmable pulse, or event input. The 1201 is capable of driving multiple loads in parallel. 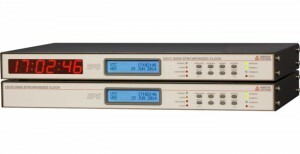 Like other Arbiter clock models, various options are available to add features such as NTP/PTP (Network Time Protocol/Precision Time Protocol [IEEE 1588]) support, four additional configurable outputs, high drive IRIG-B outputs, power system time, frequency, and Phase Monitor functions, one Form C (SPDT) fail-safe, LOCKED relay that is compatible with 129 Vdc digital fault recorder inputs; plus many more. Model 1201B/C is available with two front panel configurations (see photos and Key Features tab). Each product includes the GNSS antenna and cable, a terminal power strip, and a rack mount kit, all backed by a Five Year Limited Warranty to the original owner/purchaser. Accuracy Note Specifications apply at the 1 PPS/IRIG_B unmodulated/PP outputs when receiving four or more satellites, as of date of publication. Seventy-two (72) channel receiver: L1 GPS/SBAS C/A, L1 GLONASS CT, Galileo, and BeiDou. 5 V CMOS bus drivers with 10 ohms source impedance and ± 75 mA drive capability. One IRIG-B channel that controls both the unmodulated and modulated outputs. Configurable to Local or UTC time with C37.118.1 on or off, settings independent from Programmable Pulse IRIG-B output. One event timer channel with 100 ns resolution is standard. This function may be driven by the start bit of a received character on the serial port, or an external 5 V CMOS/TTL signal at one of the terminal strip connectors (jumper-selectable). One programmable pulse output (by a jumper connection) that may be output on a terminal strip connector or the AUX OUT pin on either COM port. Accommodates any combination of the two available power supplies in a single or redundant configuration. Choices include an universal supply or a low dc supply, both with surge withstand capability. 85 Vac to 264 Vac, 47 Hz to 440 Hz, 20 VA maximum or 100 Vdc to 350 Vdc, 30 W maximum. 22 Vdc to 67 Vdc; 30 W maximum. 19 in, 1 Rack Unit; 280 mm deep FMS. Ground Block: Antenna protective ground. Copper, with M5 (10-32) stud and nut. Connects internally to gas discharge tube (GDT) lightning surge suppressor.